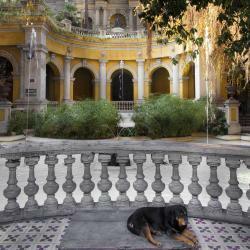 Looking for hotels near Museo Interactivo Mirador? Featuring mountain views, Dpto San Joaquín. Pasos del Metro. Campus UC provides accommodations with a fitness center, around 1.5 miles from Museo Interactivo Mirador. Located in Santiago, just 2.4 miles from Museo Interactivo Mirador, Departamento Amoblado has accommodations with a seasonal outdoor swimming pool, a fitness center, a garden and free WiFi. Home Studio with Amazing View, a property with a garden and a terrace, is located in Santiago, 2.2 miles from Museo Interactivo Mirador. Located just 2.3 miles from Museo Interactivo Mirador, Departamento Amoblado 2 has accommodations in Santiago with a seasonal outdoor swimming pool, a fitness center, as well as a 24-hour front desk. Featuring a fitness center, Palacios Las Torres offers accommodations in Santiago, 2.7 miles from Museo Interactivo Mirador and 6 miles from Movistar Arena. Located in Santiago, Arriendo Departamento a Turistas en Santiago has a private pool and free WiFi. The property is 2.3 miles from Museo Interactivo Mirador and 7 miles from Movistar Arena.